On May 12 we were fortunate to be on Maui and to have the chance to experience the last 3 miles of the famous Maliko Gulch run as part of the Olukai Ho’olaulea paddling event. 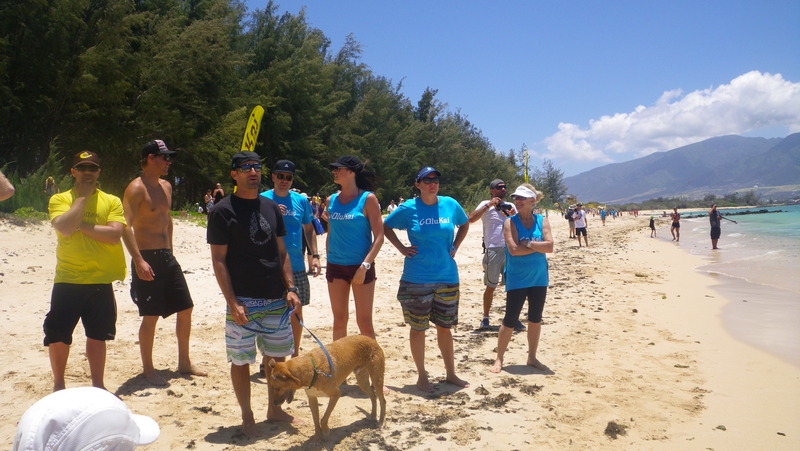 From the first contact with the team from Olukai at Paia Youth and Cultural Center to the finish of the final participants a Kanaha Beach Park it was obvious that Olukai lives their vision and mission daily. It is a lot more than the excellent products they deliver. To summarize from their website, “OluKai was conceived from a desire to create a better class of products for the life we live in and around the water. There is a strong tradition of giving an offering or tribute in Polynesian culture.” Let me share a story of just one of the dedicated Olukai team members I met and observed at the event. Heck yeah I was thirsty – I didn’t think to bring water on the SUP journey. The ice cold bottle of water she handed me was about the best tasting refreshment in the world! Because of that exchange I happened to notice Michelle throughout the rest of the day. She didn’t remain standing casually on the beach for long. As you can see by the banners, the wind had picked up by 1:00. Paddlers started arriving in droves, 10-12 at a time. 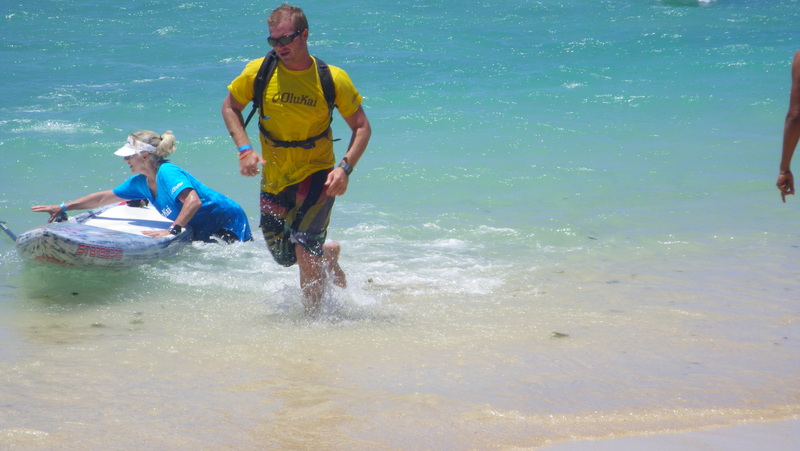 As they sprinted to the finish, they ditched their boards and dashed off. The hand full of strong young teens ready to collect the boards and stack them out of the way were overloaded in no time. Without a moment’s hesitation I saw Michelle dash into the fray, giving a hand or managing to collect and move 14 foot paddle boards for as long as it took. Splashing knee deep in the surf or slogging through the deep wet sand there was one consistent thing – a big smile and plenty of energy. That’s the spirit that pervaded the day and the event. This annual event blends elite competition with family-friendly cultural activities including canoe sailing, ancient Hawaiian games, traditional luau, hula, and live music. We had an amazing time – from the incredible clear waters and knee-knocking swells to the luau feast and traditional games. What a great way to support Olukai and to be able to benefit their “Ohana Giveback Program.” We saw it up close and first-hand. This is not a “your logo here” company! Way to go, Olukai. 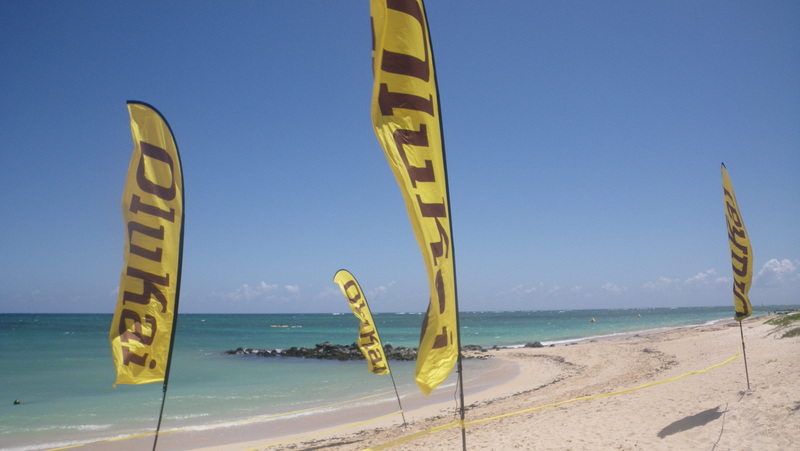 This entry was posted in Hawaii, People, SUP Racing and tagged Ho'olaule'a, OluKai by Water Words. Bookmark the permalink.